Auto-framing, facial recognition, background manipulation... these and other features are all about improving the meeting experience. It happened again. Last week at Microsoft Build conference, of all places, we got another glimpse of the future of meetings. This followed the one Cisco gave us last month at its Collaboration Summit. Actually, it seems like every enterprise-grade conferencing app maker or system vendor has of late been showing or releasing futuristic features aimed at making meetings more seamless and effective. That's because AI technologies are rapidly arriving in the conference room. They're poised to impact the quality and ease-of-use of conferencing systems in diverse and unexpected ways. The general approach is to hide the technology, as in adding features without adding buttons -- or in some cases removing buttons entirely. Meetings are focal point of collaboration. They're where everything comes together: people and teams; premises-based solutions and cloud-delivered services; email and messaging; mobile devices, desktops, and room systems; content; calendars; and tasks. When my son, the college graduate, was in diapers, conference room tech mostly consisted of an overhead projector and analog phone. There were a handful of breakthroughs along the way, such as the Polycom SoundStation conference saucer, but most of these improvements only provided incremental benefits. For example, the evolution of analog to digital to IP endpoints went unnoticed by many. The changes have been bigger and faster over the past decade. Wideband audio (HD voice) and HD video technologies have been broadly adopted along with the ability to share a screen. More recently, digital whiteboards that can facilitate ad-hoc ideation have emerged. All of these have been important, but with them came increased costs and complexities. The good news is that's about to change. At Build, Microsoft demonstrated how it can identify meeting participants, provide real-time transcription and translation, and help participants set up meetings and book available rooms all through natural language. And this was a conference aimed at developers -- they hate meetings. You can only imagine how many more conferencing ideas come at an event for enterprise communications decision makers -- as we saw at Enterprise Connect in March. Here are some examples of what's coming to a meeting room near you. The concept isn't new. Polycom introduced EagleEye back in 2011, and Cisco offers SpeakerTrack. Both mimic a virtual camera operator that pans, tilts, zooms, and switches cameras. The next generation of the technology is replacing the mechanical motors and sound-tracking equipment with AI-based auto-framing technologies. Auto-framing is becoming democratized. At Enterprise Connect, Microsoft demonstrated an auto-framing innovation on some of its Skype Room Systems. The Logitech Meetup, a system that retails for less than $1,000, will soon be able to detect and appropriately zoom and frame active speakers for no additional cost. The update hasn't been officially announced yet, but I'm guessing we'll hear more at the upcoming InfoComm conference in June. Auto-framing is a good example of how intelligence is moving to the edge. With the Skype Room System, Microsoft controls the room software. However, Logitech can enable this feature by updating its device firmware and drivers. It's remarkable that this type of AI-enabled technology can now reside on the edge of the system. Dolby also introduced auto-framing in its first video room system, called the Dolby Voice Room. It will initially be available with services from BlueJeans and Highfive. The camera uses AI-based auto-framing, can respond to gesture-based commands, and de-skew the image of an oddly angled whiteboard. There's no question that video conferencing is rapidly becoming the default method of meetings. Teams are increasingly distributed, and it seems that the offline-meeting room down the hall is mostly used as a phonebooth where employees can make private calls on their mobile phones. Cisco also has a number of AI initiatives. Last year, Cisco introduced auto-framing with no moving hardware. Cisco has also included in its newer room systems dedicated hardware for upcoming applications. Recent demonstrations have included face detection along with metadata that includes the number of participants in a given meeting. Microsoft, Logitech, and NEC are developing similar capabilities, but approaches vary. For example, Cisco uses the mobile phone as an additional identifier of the participants. Transcription services, also powered by AI, can be supplemented with facial recognition to not only determine what was said, but who said it. Microsoft Teams offers integrated translation, sharing, streaming, and search. Several vendors, including Microsoft, Vonage, and Cisco, have demonstrated or previewed speech-enabled, virtual assistants for meetings. These allow users to speak naturally to a conference system to initiate, join, or even schedule a meeting. Zoom and Microsoft are using AI to manipulate backgrounds. Zoom offers a built-in green-screen option to replace backgrounds completely. Microsoft recently launched a background blur feature that provides improved privacy. For example, blurring out those confidential notes on a whiteboard. Suddenly, every device and app is video-enabled. 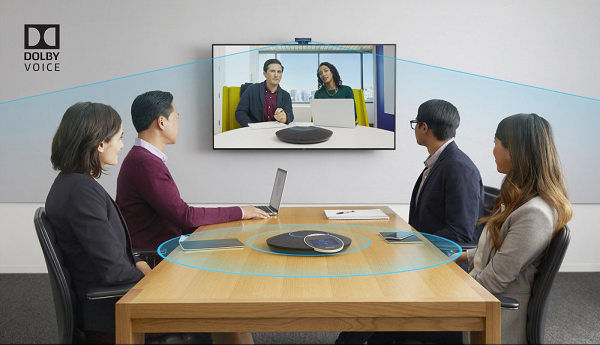 Logitech recently reported that its video collaboration unit hit a $200 million run rate. That's about $200 million higher than it was five years ago. It's USB-ready equipment is used with software from Microsoft, Google, Cisco, Zoom, and others. AI is going to make meetings easier and that's a good thing because meetings are more important than ever. That may sound strange since many people think meetings and productivity are mutually exclusive. Increasingly, meetings are where the work is getting done. That's because the tools such as content sharing and whiteboarding are more effective at collaboration with distributed participants.